What is a Pot Light? "Pot light" typically refers to a recessed lighting fixture. The term "pot light" usually refers to a recessed lighting fixture, also called a can, that is typically installed in a ceiling. These lighting fixtures are extremely simple and basic, resembling a tin can that is mounted so it is in the ceiling with no part of it protruding. Most styles of pot light have a decorative trim ring that is flush with the ceiling. These lights are especially useful for common areas that need to be brightly lit, such as kitchens, and they can be used to achieve a variety of lighting effects as well. They are relatively simple to install, especially in new construction. There is a wide range of lighting fixtures to select from when designing a home or office area. In many applications, a simple, uncluttered design is desired, making recessed lighting a good choice, and the pot light is economical and versatile with the ability to blend in with any decor. Before installation, the fixture resembles a tin can with a light socket placed in the interior. 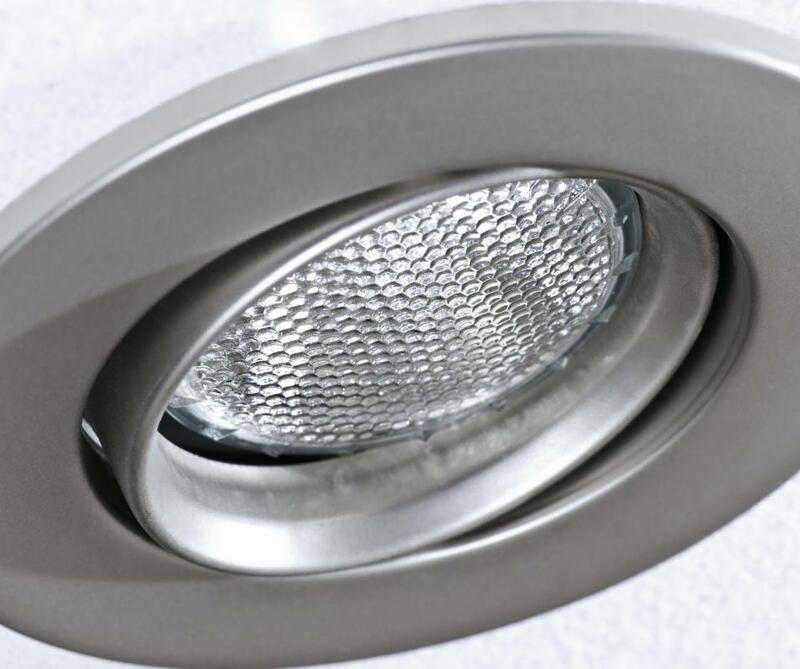 Once properly installed in the ceiling, the only part of the fixture that remains visible at all times is the trim ring, the remainder is recessed into the ceiling. If the light bulb is turned off, a small amount of the interior of the can is able to be seen from some angles; sometimes, it's painted in a neutral shade, but it otherwise retains a metallic appearance. The versatility of the pot light makes it a good choice for a range of uses. Recessed ceiling lighting is ideal in applications where consistent, moderate to bright levels of illumination are desired. The pot light is a popular choice for kitchens, bathrooms, and other high-use areas of a home. It can also be used to achieve specialized lighting effects, such as brighter lighting over areas of interest. Examples include highlighting artwork that is part of the room's design, or stronger light over a work area like a desk or kitchen counter. The installation of a pot light is a relatively simple process, but it does require electrical wiring knowledge. Unless the homeowner has experience handling household electrical work, it's often a good idea to leave the pot light installation to a professional electrician. In new construction, the lights can be installed with all the wiring completed before the ceiling drywall is put up. In rooms with existing ceilings, kits are available that only require a small hole to be created in the drywall, which is usually accomplished with a special drill bit. The new pot lights can be connected to existing wiring and screwed or nailed in place. What are the Different Types of Overhead Light Fixtures? What are Wrought Iron Pot Racks? What is a Garlic Pot?